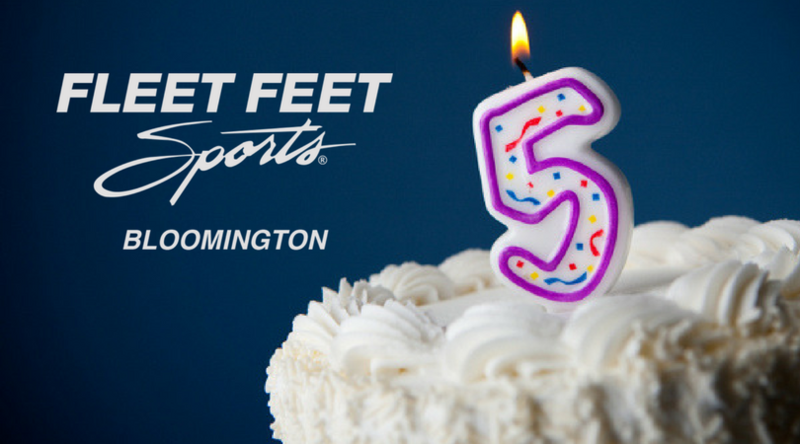 Fleet Feet Sports Bloomington is turning FIVE! This May we celebrate the fifth anniversary of opening our doors on May 23, 2013. It has been an amazing journey and we want to thank you for your support! We have a fun weekend planned and hope you will come in to shop, take part in an activity or just say hello! All weekend long we will have deals, giveaways and more! Check back soon as we announce all of our sales and add even more event details! The best way to stay up-to-date all on weekend happenings is to join our Facebook Event - click here! 6 pm - 8 pm: Ladies Night Out Run & Social - Brooks will be in attendance with demo shoes and sports bras and we've got some other special fun planned! 10 am - 12 pm: Miller Park Zoo Animals will make a special appearance - bring the kids and stop by to pet and visit! 6 pm - 8 pm: Parking Lot Party - Join us for a Fleet Feet Family social. Four Seasons Health Club will lead us in family friendly parking lot games while our favorite local chef grills up some familiar steak and chicken kabobs. Orange Leaf will provide free fruit smoothie samples! We'll provide the main entree and beverages but please bring a side dish or dessert to share. Click here to RSVP. Spend $200 or more and you'll automatically be entered into a drawing to win a gift bag stuffed with goodies! Spend $150 or more and you'll automatically be entered into a drawing to win a gift bag stuffed with goodies! All sale weekend specials return today only!